I froze strawberries for the first time last summer, and I’ve been trying to find ways to use them. The problem is that I think the frozen strawberries taste disgusting unless they are further processed after thawing. That’s not a problem with the sliced and sugared ones—throw them into a saucepan and simmer them down for a while, and they make an excellent strawberry syrup for pancakes. I can use up a lot of frozen strawberries on pancakes! It’s the ones I froze whole that are causing me trouble. 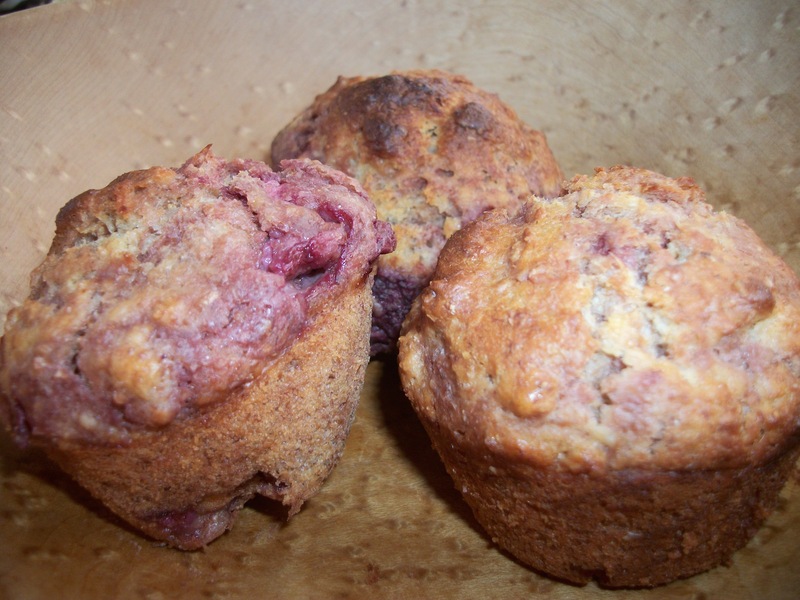 But yesterday I found a very nice way to use them—Strawberry yogurt muffins! This is a variation on Sour Cream Muffins in King Arthur Flour’s Whole Grain Baking. Mix flours, baking powder, baking soda and salt in a medium bowl. In a large bowl, cream the butter and sugar together until light and fluffy. Beat in the eggs, one at a time. Add the vanilla and yogurt. Add the dry ingredients and mix just until smooth. Slightly thaw, then roughly chop the strawberries. Fold them into the batter, and refrigerate at least an hour (for breakfast muffins, make the batter the night before, and refrigerate overnight). The strawberries will release juice, so you’ll need to give the batter another stir just before scooping it into a greased muffin tin. Bake at 400°F (210°C) for about 25 minutes. Makes 12 – 15 muffins depending on how big you like them.